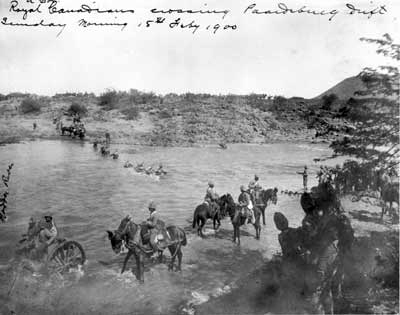 The 2nd (Special Service) Battalion, Royal Canadian Regiment of Infantry crosses the Modder River at Paardeberg Drift on 18 February 1900 to begin the assault on the Boer positions down-river to the east (or right  out of the range of the picture). On 3 October 1899, with war imminent, the British government suggested that Canada could provide several 125-man units for service in South Africa. These would be absorbed individually into British battalions or regiments, thus overcoming the inexperience of the Canadians. Prime Minister Sir Wilfrid Laurier and the Québec wing of the Liberal Party were opposed to providing troops but, on the outbreak of war on 11 October, a wave of enthusiasm in English Canada forced their hand. After two days of Cabinet deliberations, Canada offered eight 125-man units, a total of 1,000 men, all volunteers. Recruiting began on 14 October, with each of the eight units being raised at different centres across the country in order to obtain national representation. Each company included a core of professional troops from the tiny Permanent Force, augmented by volunteers enlisted for six months' service, which could be extended to 12 months if necessary. Meanwhile, the government sought to assure a strong Canadian identity for the contingent by changing its offer to a single "regiment of infantry, 1,000 strong." When Great Britain agreed to this arrangement later in October, it was a straightforward matter to combine the eight smaller units into a larger formation of 1,019 officers and men, the 2nd (Special Service) Battalion, Royal Canadian Regiment of Infantry (2 RCRI). The name forged a link to the Royal Canadian Regiment of Infantry (RCRI), the only infantry component of the Permanent Force. Unlike the regional units of the part-time militia, however, the RCRI represented the whole nation, and it could permanently carry the battle honours from South Africa after 2 RCRI had completed its tour of duty and disbanded. Members of the Permanent Force made up about fifteen percent of the total strength of the unit, and this included the commanding officer, Lieutenant-Colonel William Dillon Otter. When the battalion arrived in South Africa on 29 November 1899, after an uncomfortable month-long sea voyage, it was still a fighting unit in name only. Lieutenant-Colonel Otter estimated that a third of the battalion was without prior military service, and half the men were no better than recruits. The battalion was able to train during the two months it spent on lines-of-communications duties after it arrived in South Africa. During this period there were a few opportunities to see action, including the assault on Sunnyside kopje on 1 January 1900, in which C Company, and the machine gun section, participated alongside British and Australian troops. On 12 February 1900, the battalion joined the 19th Brigade to march and fight in the great British offensive aimed at capturing Pretoria, the capital of the Transvaal. The Royal Canadians (as 2 RCRI was often referred to at the time) were soon in action at Paardeberg Drift, suffering heavy casualties on 18 February, and mounting the famous attack that led to the surrender of General Cronje's Boer forces on the 27th. Paardeberg was the first major British victory of the war. After Paardeberg the battalion fought in the British advance on the Boer capitals of Bloemfontein and Pretoria, gaining in experience and reputation all the while. By the time 2 RCRI marched past Lord Roberts in Pretoria on 5 June 1900, it was considered by many observers as good as any battalion in the British Army. Unfortunately, Canadian arrangements to replace losses from battle and disease were totally inadequate and by this time the battalion was at less than half strength. With the Transvaal capital in British hands, and the war seemingly won, the RCRI took up lines-of-communications duties once again. The unit spent the rest of its tour of operations on this assignment, except for an interlude spent with a column of infantry chasing mounted Boer forces. The 2nd Battalion, Royal Canadian Regiment of Infantry had set a very high standard for the Canadian units that followed it on active service in the South African War.